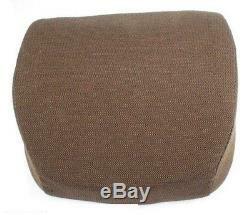 Back rest cushion, heavy-duty brown fabric cover. For all hydraulic and mechanical suspensions. Tractors: 2140 (s/n 43000-), 2350, 2355, 2550, 2555, 2750, 2755, 2855N, 2940, 2950, 2955, 3040, 3055, 3140, 3150, 3155, 3255, 4030, 4040, 4040S, 4050, 4055, 4230, 4240, 4240S, 4250, 4350, 4430, 4440, 4450, 4455, 4555, 4560, 4630, 4640, 4650, 4755, 4760, 4840, 4850, 4955, 4960, 7200, 7210 w/cab, 7400, 7410 w/cab, 7510, 7600, 7610 w/cab, 7700, 7710 w/cab, 7800, 7810 w/cab, 8100, 8100T, 8200, 8200T, 8300, 8300T, 8400, 8400T, 8430, 8440, 8450, 8560, 8570, 8630, 8650, 8760, 8770, 8850, 8870, 8960, 8970, 9100, 9200, 9300, 9400. Combines: 3300, 4400, 4420, 6600, 6602, 6620, 6622, 7700, 7720, 8820, 9400 Maximizer, 9410 Maximizer, 9500, 9500 Maximizer, 9500 Sidehill, 9510, 9510 Maximizer, 9510 Sidehill, 9780, 9600 Maximizer, 9610 Maximizer, CTS, CTS II. Cotton Pickers: 9920, 9930, 9935, 9940, 9950, 9960, 9965, 9970, 9976. Cotton Strippers: 7440, 7745, 7450, 7455. Forage Harvester: 5420, 5440, 5460, 5720, 5720, 5730, 5820, 5830. Windrowers: 2280, 3430, 3830, 4890, 4990. Sprayers: 4700, 4710, 6000, 6100, 6500, 6600, 6700. The item "SEAT BACK CUSHION John Deere 2140 2350 2355 2550 2555 2750 2755 2855N 2940" is in sale since Monday, July 23, 2018. This item is in the category "Business & Industrial\Heavy Equipment, Parts & Attachments\Heavy Equipment Parts & Accessories\Antique & Vintage Equipment Parts". The seller is "justauctions" and is located in Sparta, Michigan. This item can be shipped worldwide.